Dollys Gallery. Made by Reutter Porcelain. Dollhouse Miniature Black Forest Cake Set. Black Forest Cake is sitting on a beautiful Porcelain Cake Stand. one slice has been removed with gold Cake Server. Reutter Porcelain Doll House Miniature Teddy Bear ABC Breakfast Set Bowl, plate, mug, all decorated with teddy bear plus a tiny figurine of a teddy bear with a gift box plate approx 1 " diam Just perfect for your dollhouse or miniature setting. Very realistic. Scale is 1:12. Made by Reutter Porzellan of Germany, a company known for the superior quality of their porcelain and miniatures. Not meant for small children. Dollys Gallery. Made by Reutter Porcelain. 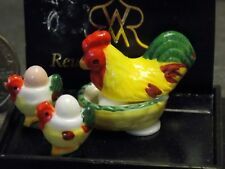 Dollhouse Miniature Chicken Basket Server with Eggs. & 2 Chicken Egg Holders. Made of Porcelain. See other sets ofDollhouse Reutter Porcelain in Blue Onion Pattern. Reutter Porzellan of Germany has an established reputation for creating high quality elegant dollhouse miniatures, well-crafted and beautiful to behold. Dollys Gallery. Made by Reutter Porcelain. Dollhouse Miniature Large Blue Onion Soup Pot. filled with Vegetable Soup. Reutter Porzellan of Germany has an established reputation for creating high quality elegant dollhouse miniatures, well-crafted and beautiful to behold. in Blue Delft Pattern. see other sets ofReutter Porcelain dollhouse miniatures at gemjanes. These are some practical pitchers in the pink & white flowers pattern by Reutter Porcelain. One is the typical pitcher that might hold milk or water at the dinner table, while the other is shorter and wider, making me think it is more for mixing or baking. This comes from my own personal collection and has never been displayed. Please feel free to ask questions. I do combine shipping. Made by Reutter Porcelain. Dollhouse Miniature Christmas Gingerbread House Set. Dollys Gallery. 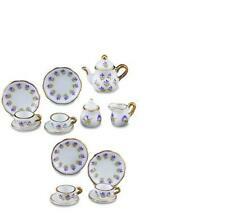 See other sets of Dollhouse Reutter Porcelain in Blue Onion Pattern. Reutter Porzellan of Germany has an established reputation for creating high quality elegant dollhouse miniatures, well-crafted and beautiful to behold. Reutter Gold Blue Onion Spice Box Set Zimt Muskat Salbei gemjanes 1.818/8. Reutter Porzellan of Germany has an established reputation for creating high quality elegant dollhouse miniatures, well-crafted and beautiful to behold. Reutter Porzellan of Germany has an established reputation for creating high quality elegant dollhouse miniatures, well-crafted and beautiful to behold. pair of porcelain candlesticks. see otherReutter Porcelain dollhouse miniatures at gemjanes. Soup Ladle. 1:12 Scale. This is sized for a dollhouse. 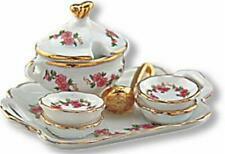 This is a lovely porcelain dinner set that would add an elegant touch to your miniature scene. This is a rose motif with leaves and black and gold trim. 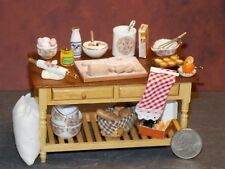 This is a lovely set of dishes for a dollhouse made by Reutter Porzellan. They are white with blue flowers and gold edges. Three of the place settings are glued with pads between them. I detached one setting. CHRISTMAS TEA SERVICE FOR TWO DOLLHOUSE MINIATURE by REUTTER PORCELAIN Here's a festive tea or coffee set for your dollhouse Christmas entertaining. Features Santa in front of a decorated Christmas tree. The set includes a tea pot or coffee pot, platter 2" long, two 3/4" plates, two cups, two saucers, sugar bowl w lid and creamer. 1:12 scale Each porcelain piece is hand embellished in 22k gold & is food & dishwasher safe! Proudly made in Germany by Reutter Porzellan – “Where quality still counts!" Guaranteed to be as described. Reutter Porzellan of Germany has an established reputation for creating high quality elegant dollhouse miniatures, well-crafted and beautiful to behold. see other sets ofReutter Porcelain dollhouse miniatures at gemjanes. Dollys Gallery. Made by Reutter Porcelain. Dollhouse Miniature Cake Set. with 2 Porcelain Place, a Cloth Napkin with Gold Ring and Gold Cake Server. This is a very unique piece in the older Blue Onion pattern by Reutter Porcelain. It consists of a rolling pin with gold handles, a scoop with gold trim, and a salt cellar also trimmed in gold. The lid appears to be separate but I have not tried to pry it off for fear of damaging it. This comes from my own personal collection and has never been displayed. Feel free to ask questions. I do combine shipping. 1in to 1ft. 1:12 Scale. This is sized for a dollhouse. There is a Santa motif on each porcelain item. Coffee pot with removable lid. Detailed scale model for adult collectors. Not intended for children under 14.